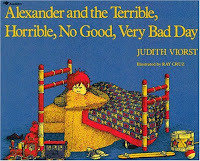 Maybe today you are having a terrible, horrible, no good, very bad day. Fortunately when this happens we are not hopeless or helpless. Isaiah 61: 3 says, "Provide for those who grieve…a garment of praise instead of a spirit of despair. They will be called oaks of righteousness, a planting of the Lord for the display of His splendor." God provides for those who are having terrible, horrible, no good, very bad days. We do have to put ourselves in position to receive what He has provided. It doesn't just fall on us. For me that means immersing myself in praise, worship and prayer. Completely immersing. Getting off by myself, and getting under the tap of God's presence and not moving until the terrible, horrible, no good, very bad time is past. Did you ever burn yourself? Recently I did. I'm still healing from second degree burns on my foot and thigh. I learned one of the first things you do for a burn is immerse it in cool water. I noticed my thigh and foot felt relief when I sat in the cool tub but when I would lift up out of there they starting hurting again, throbbing terribly. So I sat there, for a long time. I didn't remove myself from the tub until I could handle the pain level without being immersed. Some days you need a soaking in God's presence for an extended time, otherwise the heaviness is too great to move on with the rest of your day. The problem in many people's case is that they try to limp along without the presence of God. There's no victory in that, just perpetual heaviness. Soaking brings a lifting that doesn't come any other way. what an awesome analogy. I love the way God shows you Truth in everyday occurrences!